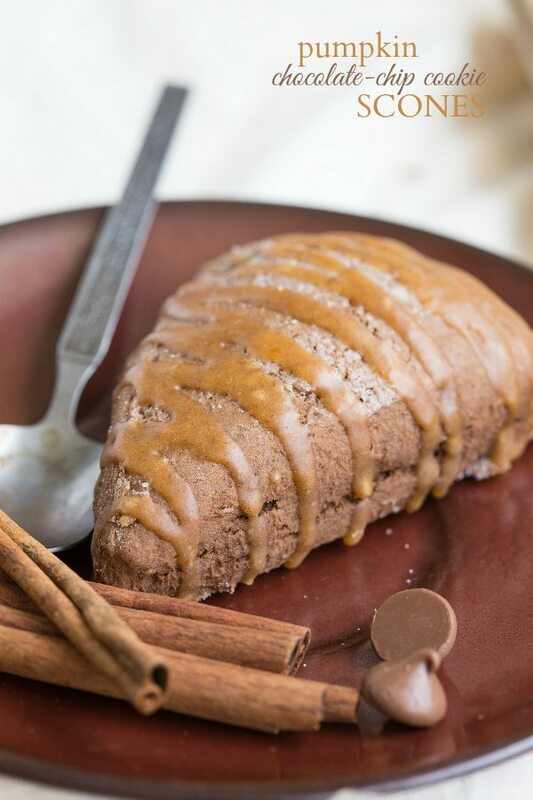 These chocolate pumpkin scones have all the great flavors you know and love from pumpkin chocolate-chip cookies. PLUS there are chocolate chips in them and a delicious cinnamon-spice pumpkin glaze covering them! And it’s time to bring out the pumpkin. 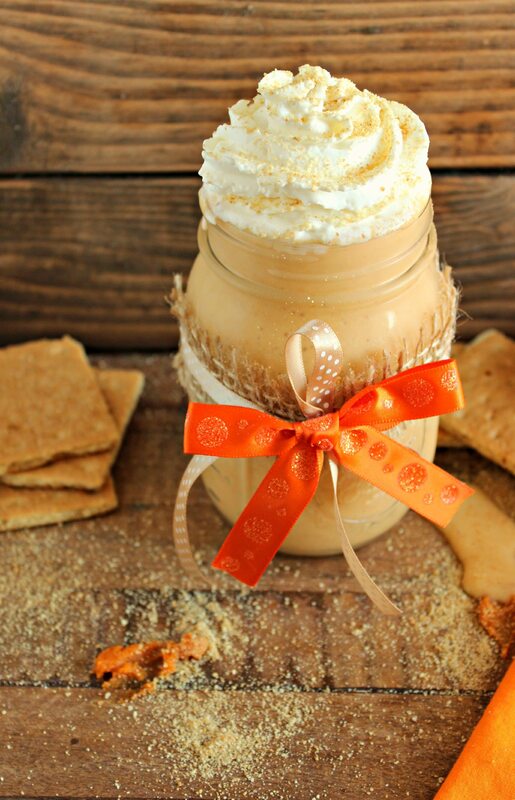 Because I’ve got about 15 different pumpkin recipes you’re going to want to make! In my mind summer is long gone. In preparation for the blog, I’ve started baking with pumpkin, cinnamon, and other comfort food ingredients and automatically I felt like it was Fall despite the still warm weather and lack of Fall-signs (no boot wearers, no pumpkins sitting out on people’s front doors, no leaves changing colors…). ALLLthough, I have been seeing Fall decor in some stores, therefore, it is all working out in my mind that Fall is here. Despite the twenty something days left of official summer. On a totally random side-note, does anyone type “pumpking” when trying to type “pumpkin”? So far, every single pumpkin has been a pumpking that I edited. Please tell me I’m not the only one with this problem? Type it up and lemme know! Anyways, I’ve been so excited to share this recipe with you all since I made it about a week and a half ago. I actually made these with my sisters while I was in Utah. It’s always fun baking for a larger crowd since I get so much feedback on the recipes. And if you were wondering – overwhelmingly positive feedback for the few pumpkin recipes we made. If you’ve ever made scones you probably know they aren’t too hard to make. In fact, they are really simple and don’t take too long at all. Once the scones have been all cut out, I like to brush the tops with a little bit of the extra buttermilk (or heavy cream if you’d rather use that) and then sprinkle the tops with some white sugar – this helps to brown and almost caramelize the tops of the scones during baking. It adds the slightest “crunch” or different texture to the scone which I love. A few extra tips for these scones: always line the baking tray with parchment paper – this keeps the scones cooking evenly and prevents the bottoms of the scones from burning and sticking to the tray. Another tip has to do with the butter – the colder you are able to keep the butter throughout the making process, the lighter and less dense the scones are. And finally, the less you are able to stir and knead your dough, the lighter the scones will be. The more stirring and kneading you do, the denser these become. In a large bowl, beat together the buttermilk, egg, pumpkin, and vanilla. In a separate bowl, combine the flour, cocoa powder, white sugar, baking powder, salt, allspice, cinnamon, and ground cloves. Stir together until completely combined. Cut the room temperature butter (do not soften or melt) into small cubes. Using a pastry blender or two knives, cut the butter into the dry mixture until it resembles coarse crumbs. Slowly add the dry to the wet, stirring just until a thick dough is formed. Add a little bit more buttermilk or flour if needed. Pour the mixture on to a floured surface and knead until it comes together into a ball of dough. You don't want to over-stir or over-knead the dough or it will make for a tough and less soft scone. Shape the dough into a round circle and cut into eight different scones or wedges. Using a pastry brush, brush a little bit of extra buttermilk over all of the scones. Sprinkle lightly with white sugar. Bake for 18-20 minutes or until a toothpick when inserted comes out clean. Then remove from the oven and allow to cool. Once cool, you can top with the glaze. To make the glaze, beat together all of the ingredients adjusting the seasonings as desired. Pipe (in a frosting bag or plastic bag with top cut off) or spread (witha butter knife) onto the scones. The last paragraph in the post has a few scone tips - check them out before making these! YUM! I am holding off on the pumpkin stuff. October is pumpkin month for me. I like to hang on to every ounce of summer. Once October hits I will be all over these scones! OMG I love pumpkin everything. It’s been fall at my house as well (I’m making pumpkin pancakes, granola, parfaits) and it smells AMAZING cooking. Love that added benefit. 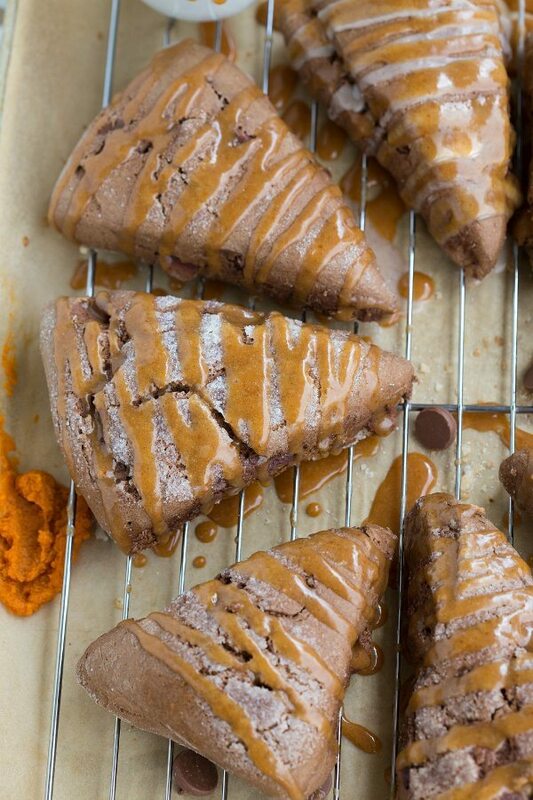 Love the mix of chocolate and pumpkin and haven’t made a pumpkin scone yet — thanks for the idea it sounds amazing! The glaze is what brings it to the next level I’m sure! Thanks for sharing! How sweet are these! I’ve always been scared on making scones but seeing these makes me think I need to give them a go! What a delicious way to kick off September. Bring on the pumpkin! Chelsea, these scones look AMAZING! I can’t get over how delicious these look! I am such a huge pumpkin lover, so I can’t wait to see all of the recipes you have in store for us. Pinning this one! 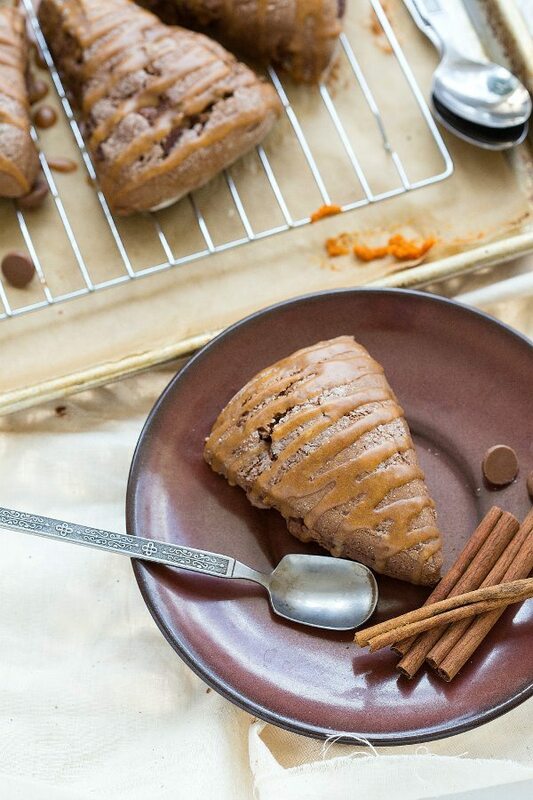 These pumpkin scones look fabulous! I am so ready to eat some pumpkin! I think this would be my favorite scone ever!! LOVE. EVERY single time I type pumpkin i type pumpking – sooo funny that you mention that! 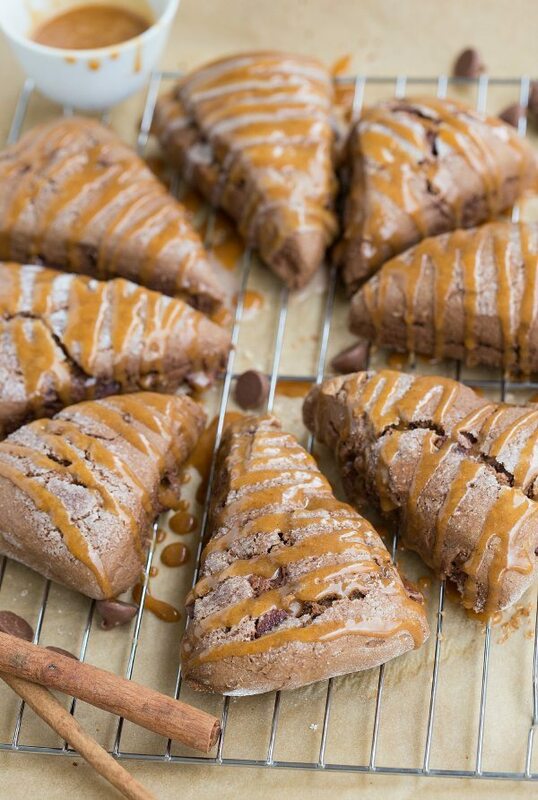 I’m dying over these scones – they look incredible! You are such a good blogger, already full of pumpkin recipes! 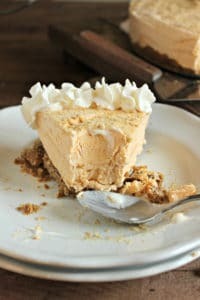 I couldn’t bring myself to do it until August was over, but my list of pumpkin (just typed pumpking) things to bake is getting longer by the minute! Omg, these scones!! I haven’t been able to make myself make anything fall flavored yet because it’s so hot, but I am absolutely dying for one of these. Scones are on my list of things-to-make, and I love the flavors you went with. 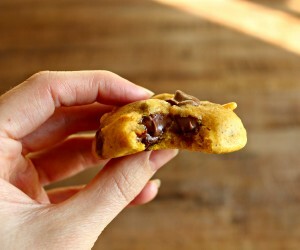 Chocolate chip cookie and pumpkin, so fun! Also the thing about “pumpking” totally cracked me up, haha. 😀 Pinned! these scones sound incredible!! but i haven’t allowed myself to bake with pumpkin yet. i wanted to wait til sept 1. pinned to try them! These are beautiful! I think I could eat a plateful! I am so happy to see fall food! I am a scone lover, a pumpkin lover and what self respecting middle woman is not a chocolate lover. So this recipe lands in The Perfect Scone Recipe roster. Oh man, this makes me want to run to the store in my pjs and buy ALL the cans of pumpkin! There’s nothing tastier than a scone with your morning coffee, especially when the weather starts to get a little colder. I must admit that I live on the coast of California, so I don’t really see much of the Fall season, though ;). And I laughed at your dad asking if it was okay to eat more! Me needing to take photos before everyone digs in is the bane to my family’s existence haha! These look amazing! I love scones and these look so soft and flavorful. And your drizzle…it’s perfect!! YES!!! I always type pumpking when I type pumpkin. It’s so frustrating, especially when you know how to spell. You’re like Grrrr!!! That’s not right! 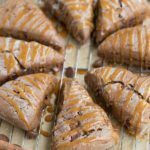 🙂 These scones look absolutely amazing ~ and I’m loving that you have 15 pumpkin recipes to share. I think that’s fantastic since fall and pumpkins are some of my favorite things! I have never made chocolate scones before.. and I have no idea why! They are seriously such a good idea and I bet they taste amazing.. pinned! I’ve been eyeing these for the past couple days and I’m wondering how I’ve gone so long without baking them! I’ll have to do it ASAP. I am ready for fall! Totally irresistible! need these now! Thanks for linking up with What’s Cookin’ Wednesday! I made these this morning. They are fabulous. I make a lot of scones. This recipe was spot on. I used a tad more liquid, but just a splash. The pumpkin flavor/spices are subtle. The cocoa powder is a nice touch. Highly recommend. Thanks for sharing.